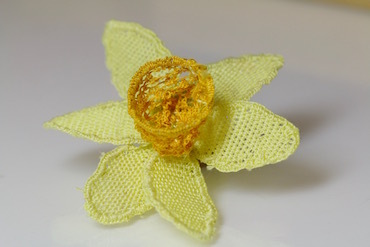 Three stitches create this pretty little 3D daffodil. If you haven't tackled needlelace before you may wish to try my simple heart tutorial first, which introduces the first two stitches. The third is explained in full on this page. Print out the pattern pieces here. Cut them apart leaving space around each one (don't cut on the pattern lines). 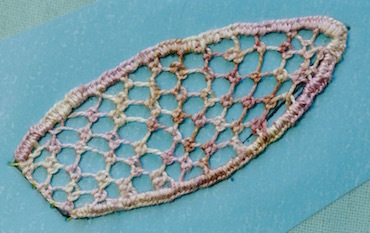 Attach each piece to a needlelace pad (instructions here) with a piece of matt sticky backed plastic. We use a matt film, as a glossy one would reflect your surroundings and could be distracting. 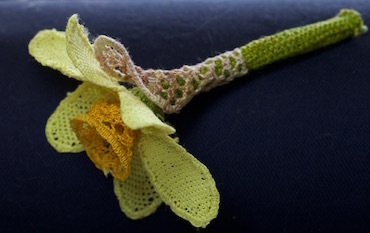 You will need to stitch 6 petals for your daffodil. I find that I can reuse the same pattern for two or three petals before printing or tracing a new one. Couch a doubled length of thread around the drawn shape, taking your stitches through the film, paper pattern, and all three layers of your fabric pad. Loop one of the ends of the couched thread through the beginning loop to ensure your outline is continuous and won't come apart once you remove the lace from the pad. The stitch used is corded single brussels (also known as detached buttonhole stitch), which is explained in detail in my basic heart tutorial. You can choose whether to make short rows across the petals, or longer ones along their length, but keep this consistent for all petals. I find shorter rows make it less likely that I will run out of thread in the middle of a row. When each petal is complete, work buttonhole stitches, close together, around the edge. Turn your work over and snip the couching threads on the back. 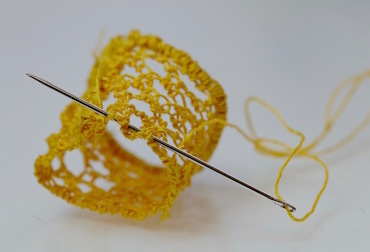 Gently release the lace from the pad, and use tweezers to remove any remaining couching stitches. 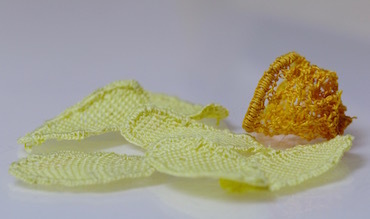 The trumpet of your daffodil uses Pea Stitch, which requires two repeated rows to form the pattern. However, you first need to create a foundation row of single brussels stitch (no cord) across one of the long sides of your rectangle, starting from the left hand side. Try to keep these stitches evenly spaced. Take the thread around the cordonnet (outline) ready for the first pattern row of your needlelace. Make a detached buttonhole stitch into each of the first two loops of the foundation row. Then miss two loops. Repeat till end of row. If you can't fit both of the stitches in at the end, don't worry, just work one of them. Keep your tension loose but consistent. You want to end up with neat stitches, a larger loop between the groups of two, and all stitches a similar size if possible. Now work back in the opposite direction (left to right) making three stitches in each large loop and one stitch into each smaller loop. Sometimes you may find the row above twists under itself sightly. In this case use your finger to "roll" it back into place so that you can clearly see the loops of the previous stitches. Repeat these two rows, until your rectangle is full. Try to finish with the second row. Whip the loops of your last row to the cordonnet at the bottom. The photo shows that I went wrong in the center, but don't panic if this happens to you. It really won't show in your finished flower. Lay a length of paper covered wire on top of the cordonnet at the bottom of your rectangle. Couch it in place with sewing cotton. Work close detached buttonhole stitches over the cordonnet and wire. Release the lace from the pad and stitch the short sides of the trumpet together. Using the tatting thread, work running stitch around the other long edge of your trumpet piece. Pull tightly to gather this edge, then fasten off securely. You now have all the elements of your daffodil flower ready to put together. Using the thread you worked the petals in, attach each petal to the outside of your trumpet with small stitches. Overlap each petal a little as you work your way around the flower. I felt the flower by itself was missing something, so I decided to create a stem with the papery beige sepal just below the bloom. You can use tatting thread in a green of your choice, but I decided to use a space-dyed silk for mine. The stem is stitched in corded single brussels taking the rows down the length of the stem, rather than across the short end. There is no need to buttonhole over the edges as we are going to roll up our piece of lace. However, after taking it off the pad, you will need to couch a folded length of wire along one long edge. Leave the loop where the wire is folded sticking out one end slightly as shown in the photograph. Trim the other ends of the wire level with your lace. We can't couch the wire in place while the lace is on the pad, as these stitches will remain in the finished project. Take your flower and run a gathering thread around the bottom, about 1cm from the center joining point. 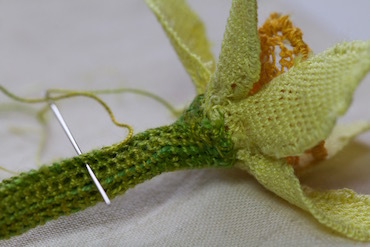 Pull the gathering stitches tight to create a sort of stub below the flower. Then wrap the short end of your stem around this stub and stitch it in place, with the loop of wire peeking through the center of the flower. Take a couple of stitches through the wire loop to help secure the stem in place. This is a rather fiddly job, so take your time. The roll the rest of the lace around the wire to form the stem, and catch stitch it in place down the length. Mount the sepal pattern onto your pad, and couch the doubled outline in place. 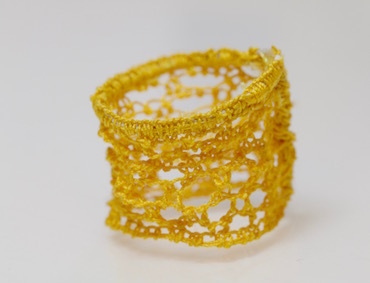 You can use a beige tatting cotton, but I chose to use a space-dyed fine cotton thread in pinky beige tones for mine. 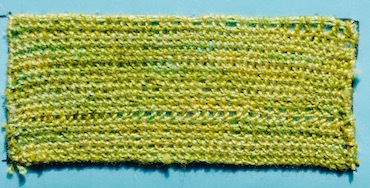 The sepal is worked in double brussels stitch. Buttonhole over the sides of this piece of needlelace, leaving the flat edge unstitched, before removing it from the pad. Attach the sepal to the stem, by wrapping it around the stem so that the tip of the sepal sits underneath the petals. Stitch in place around the flat base and take a few stitches up the sepal to ensure it stays wrapped. Leave the rest unattached.